Legend has it that this play was commissioned by Queen Elizabeth I who was eager to see more of lovable rogue Falstaff. Whatever the play’s provenance, director Phillip Breen brings it right up-to-date and delivers an evening of non-stop laughter, setting the action in an Ayckbournesque world of anoraks, rugby matches, folding chairs and picnic coolers. It fits Shakespeare’s most farcical comedy very well and yet again proves, to me at any rate, the mastery of the playwright in every genre. The titular wives, Mistress Ford (Alexandra Gilbreath) and Mistress Page (Sylvestra Le Touzel) each receive love-letters from Falstaff. They recognise at once he is on the make and plot to humiliate him mercilessly. They make a formidable double act, with Gilbreath’s sensuality and Le Touzel’s more regimented approach. As their schemes come to fruition, and we, in on the joke, laugh along with them, they are merry indeed. Other plotters are not as adept or as successful. 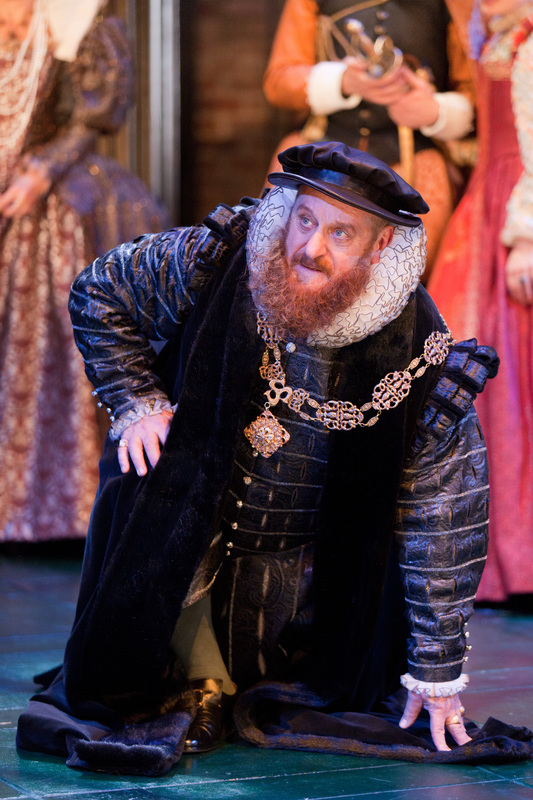 Ford himself (John Ramm) dons a disguise and hires Falstaff to test his wife’s fidelity. It’s a hilarious, sit-com turn from Ramm, complete with dodgy wig and bombastic seething. Though he isn’t cuckolded by his merry wife, he is certainly held up for ridicule for his unreasonably suspicious nature. When he realises what an absolute, misguided fool he has been, he bursts into tears in a manner that is equally hilarious. There is very little sentimentality in this production. Thank goodness. Anita Dobson dazzles as go-between Mistress Quickly. Dressed like Sybil Fawlty, she charms with her word play and clearly character and actress alike are enjoying themselves immensely. There is strong support from a host of actors in the subplot about Ford’s daughter’s three suitors. Calum Finlay amuses as the ninny Slender; Bart David Soroczynski struts and frets as the French Doctor Caius, mangling English and swishing his fencing foil. This is Allo, Allo with better dialogue. Contrasting performances, both very funny. David Sterne is an energetic Shallow, Thomas Pickles an engaging Simple but without doubt the evening belongs to Desmond Barrit’s Sir John Falstaff. 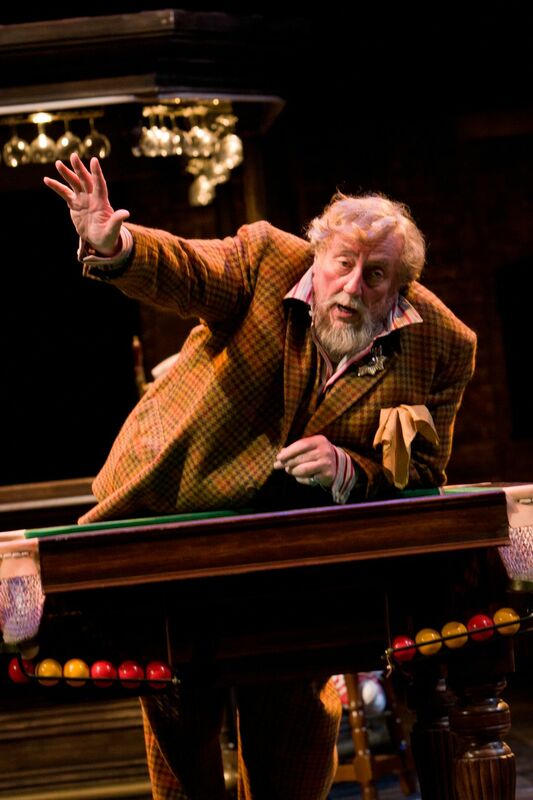 From his first entrance in a chequered tweed suit, through his disguise as the Fat Woman of Brentford and his adventures with a laundry basket, to his final, antlered humiliation in the forest, this is a master class in comedic acting, making the most of his padded physicality as well as the excessive nature of the character. You can’t help loving him. Naomi Sheldon has poise as teenage daughter Anne, keeping her on the right side of headstrong, and Paapa Essiedu charms as her handsome suitor Fenton. Breen doesn’t miss a trick. The attention to detail wrings the humour from every moment. I particularly enjoyed the drunkard Bardolph (Stephen Harper)- the energy of the show doesn’t let the pace slacken for a second. There are some riotous moments of action but it is the comic playing of the cast (too numerous to mention them all individually) that keeps things ticking and sometimes sprinting along. Max Jones’s set design allows transitions that flow like a musical, seamlessly taking us from the pub to the rugby field to the Fords’ living room and so on. The fifth act contains the final humiliation of Sir John. It’s a sort of parody of a masque that would have been all the rage back in the day. Here it’s updated with some hilarious costumes. It’s a play about practical jokes and the cruelty involved. Sir John pays for his confidence tricks but so too do the tricksters. Their machinations to marry Anne off to their preferred suitor come to nought. And it serves them right. A delightful production on every level, this will get you merry on a cold winter’s night. If we have Good Queen Bess to thank for this play, I am very grateful indeed. Royal Command Performances have gone downhill, I fear, since her day.